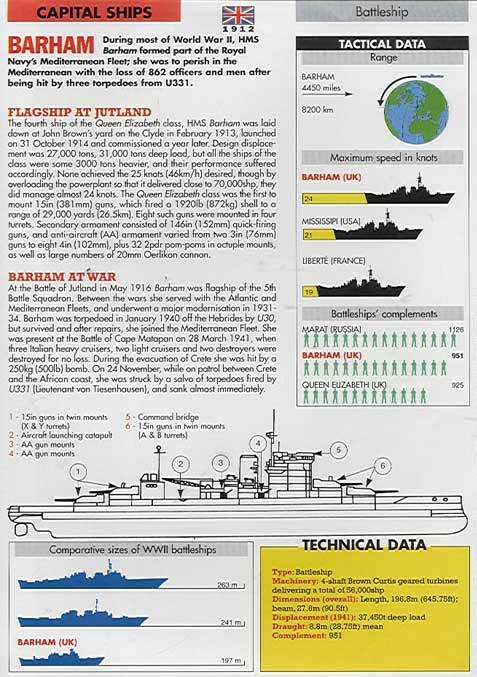 Was plasma used on HMS Barham? The HMS Barham was built by John Brown, Clydebank. The name 'Barham' came from Admiral Charles Middleton who was Lord Barham. He became the First Lord of the Admiralty at the time of Trafalger 1762-1813. He also worked with Admiral Horatio Nelson. Did General De Gaulle visit Barham? "The darkest period of WWII was the four months prior to the action at Dakar. These were the days when the British people truly stood alone against fearful odds. After the evacuation at Dunkirk in May/June 1940, Italy had entered the war. At home, Britain faced the danger of invasion, endured concentrated bombing raids, and fought the Battle of Britain. In the Mediterranean, there was the threat to the vital sea link to Suez, the Persian Gulf and the Far East. France had capitulated and the Germans had overrun the Low Countries and Norway. According to Churchill, Vichy Premier Pierre Laval was actively promoting war against England (which he wanted "�crabouill� - squashed so as to leave only a grease spot"). The coastline from Tromso in the north of Norway to Biarritz in Atlantic France was effectively under Nazi control. There was a Fascist regime in Spain and German sympathisers in Southern Ireland. Britain was almost surrounded. The USSR had signed a Friendship Treaty with Hitler and the United States would not enter the war until eighteen months later. Shortly after war was declared, HMS Barham was torpedoed off the Isle of Lewis. By June 1940, her Liverpool refit had been completed and, to ready for action, she joined the Home Fleet at Scapa Flow for stability and firing tests. She was not involved in the tragic events at Oran and Alexandria, which were necessary to prevent the French Mediterranean Fleet from falling into German hands. However, by the beginning of September 1940, Barham was at Freetown, Sierra Leone, preparatory to action at Dakar. By the autumn of 1940 the situation had improved. The Battle of Britain had been won and the danger of invasion had receded. Churchill was anxious to get the newly formed Free French into action as soon as possible. Although apprehensive about prompting Vichy France to declare war on England, the War Cabinet decided to land a force of Free French under De Gaulle at Dakar, Senegal, the purpose of which was to establish a stronghold in Colonial French West Africa. Dakar was chosen for military reasons. There was the fear that Dakar would provide strategically placed bases for U-Boats and aircraft operating in the Atlantic should it fall into German hands. Additionally, it provided an opportunity for De Gaulle and the Free French to join in what was their first action after the fall of France. On September 23rd, the Anglo-French fleet approached Dakar in the hopes that the local population would turn against the Vichy. This did not happen and the fortress, defended by shore batteries and the battleship Richelieu, opened fire. The Vichy refused to give up and resolved to defend the fortress to the last man. As so often happens in war, things did not go as planned. Fog prevented De Gaulle from landing his troops. Barham spent three days bombarding the shore batteries and engaging Richelieu and other smaller warships. She was hit four times but not seriously damaged. During the action, she swerved to avoid three torpedoes which then struck HMS Resolution. Listing, Resolution was towed to Freetown by Barham, and eventually repaired in the U.S. In the action, the Vichy lost a submarine and two destroyers and the Richelieu was effectively put out of operation for the duration of the war, there being no adequate repair facilities in the region. By September 25th, it was evident that Dakar was going to be defended to the end and to continue the action could so inflame passions, that the Vichy Government might make good their threat of a declaration or war. "Men of vichy, men of vichy, symbols of a nation's shame. Not for you the torch of heros. Not for heros that sacred flame. Breathes the spirit of Clemenceau in the land that was his soul? Mark his value as it surges in the body of De Gaulle. Men of vichy, men of vichy, see the course of freedom set. Be thee strong or be thee craven, France shall stand in glory yet." From the time Barham arrived at Scapa Flow, up to the day she was torpedoed, my father wrote numerous letters home. All his letters were censored and most arrived safely. His personal feelings after Dakar are reflected in the following extracts from this correspondence: "It gives me a thrill to recall that we were in action at Dakar. We were in action throughout a spell of 3 days - from 23rd to 25th Sept, fighting four actions in all. We put up a pretty good show in difficult conditions, and having been assailed by every method known to naval warfare, we live to fight another day". "I have just been reading a recent article in the Spectator, in which the writer says that all competent observers are convinced that Hitler's chances of victory are receding every day, and the end of 1940 will see the disappearance of his last hope. I hope we are not becoming too complacent; that is the danger. But I think we can trust our leaders now to keep us on our toes, while "the springs of our offensive are being compressed". "It seems that, as some reports of our activities on the West African coast have appeared in the newspapers, the censorship ban can be lifted very slightly���... I suppose I am entitled to say that this ship went through a very long sustained action - indeed, I believe the longest of the war so far." "The various actions in which we were engaged lasted, off and on, through three days. They took place in perfectly frightful climatic conditions, but everyone in the ship behaved with great enthusiasm and cheerfulness. The temperature in my Medical Station was between 120 and 140 degrees all the time. We wore next to nothing and sweated pints for hours on end. Although the ship received several hits, there was no serious damage and no casualties, except a minor one". After Dakar, Barham joined Admiral Cunningham's Eastern Mediterranean Fleet, based in Alexandria. My father decided to take French lessons while the ship was in port, and wrote a letter home in French. I often questioned the reason for the sudden enthusiasm for French. Could it have been that the General had been on Barham either before, during, or after the battle? If he had been, it is probable that my father would have met him in the Wardroom. Again, if so, he would have been frustrated in not being able to converse in French, hence the lessons. Seeing that his letters were censored, he would not have been able to mention anything about the encounter. I understand that there is a reference in the Imperial War Museum archives to a photograph of De Gaulle on HMS Barham. A year ago, a researcher contacted me regarding a BBC television documentary on Churchill and De Gaulle with specific reference to Dakar. Living in Canada, I am unaware as to whether the programme has been aired and throws any more light on Barham and De Gaulle. After Dakar, and before the end of 1940, the Barham survived an attempt by Italian frogmen to torpedo her and joined in the attack on Taranto. Before her sinking in November 1941, she was in several actions starting with the bombardments of Bardia and Tripoli, the Battle of Matapan, and the evacuation of Crete.